Marketing tips for romance writers. Many authors will also tell you that publishing romances makes writing worthwhile, if it’s a regular paycheck for your writing that you’re looking for. Why? Well, there are lots of romance readers — 29 million of them to be exact. And, surveys indicate that about a quarter of these readers complete a book a week. So in rough figuring, that means there are at least seven million romance books sold every week. The question for most of us authors, though, is how to ensure that our book gets to be one of the popular ones. While marketing plays a big role, market demand plays a bigger one. Here are some of the things you need to know if you want to make money selling romance ebooks. Readers are a fussy bunch. Really. When you think about it, you probably have specific storylines or settings or conflicts you like to explore when you read. I know I do. So, it’s not much of a leap to see how important it is to know what sub-genres your readers prefer. The other piece of knowledge we need though, is how much competition our books have. Remember those foot races back in elementary school? If some other event kept a number of the other girls from the big “ribbon” day, I had a chance at earning one myself. But if we had another school join us for the big field day and double the competition, well, I was sunk. Selling ebooks is the same. The more competition you have, the harder it is to make sales. Wouldn’t you like to know what romance sub-genres are hot sellers? And which ones have the most competition. You can with a K-Lytics report. I buy all of the relevant ones for my writing as soon as they’re released! Don’t worry though, as you can start your market research without one. Here are five facts to help you get going. If you’ve got a pen handy, try jotting down all of the romance sub-categories you can think of. How many pop into your head? My list starts off with contemporary, fantasy, westerns, well, it’s pretty straightforward. And well, short. My list sure doesn’t get to the 425 Kindle categories and sub-categories included in the K-Lytics report! That list includes things like Paranormal, Ghosts; Historical romance, Victorian; Inspirational, Christian; Military; Multicultural & interracial; science fiction, and well, lots more. But you’re likely wondering how you can take advantage of this to make more sales — thus more income — with your romance novels. The answer is actually pretty simple. It’s understanding the romance genre as a whole and being able to slot your own ebooks into the right sub-categories. Amazon uses the industry BISAC subject codes. So, when you upload your ebook to the Kindle store, you need to pick the most relevant two (that’s the limit) for your book. Then, Amazon converts them to their browsing codes that buyers use to find their next read from the Kindle store. The catch with the romance category though, is that you also need to add keywords to the metadata for your ebook to end up in some of the browsing categories. You’ll find the specifics on Amazon’s website under the link: Categories with Keyword Requirements. The competition is keen in the ebook romance market. But did you know you could get the statistics on a daily basis direct from Amazon? The following screenshot is from an Amazon search you can do for any genre or sub-genre as often as you like! Number of books in the romance category on Amazon’s Kindle store. So, on the day I took this screen capture, there were 825,513 ebooks in the romance category. That’s a lot of competition! However, if you scan down, you’ll see that there were only 6518 titles in the Women’s New Adult & College Fiction browsing code, compared to 141,390 in contemporary romance titles. That’s a big difference, isn’t it? As you can see from the screen capture above, the list of romance sub-genres doesn’t seem all that long. So, how do you find out what those 400+ sub-genres are? Again, you can get the data directly from Amazon with another search. This time, I searched for “paranormal romance” and this is the results screen capture. 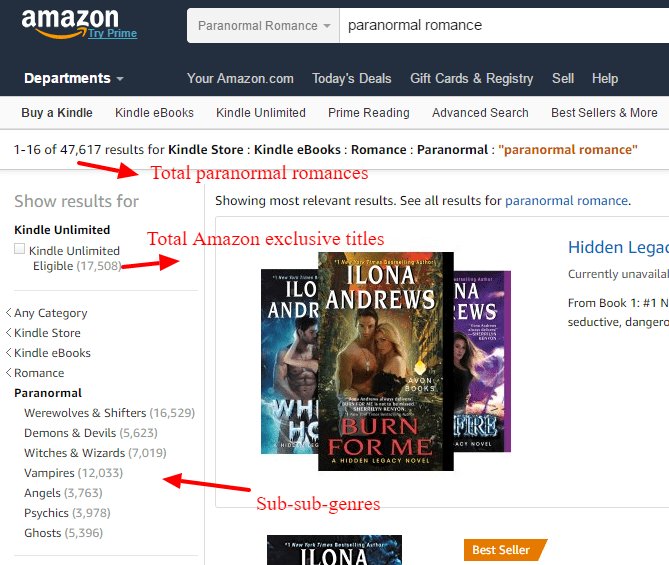 Screen capture of romance paranormal sub-categories in the Kindle store. Have you been wondering why I keep adding arrows to the count for titles in the Kindle Unlimited Eligible (Exclusive to Amazon) category? Well, this is a good statistic to consider when deciding whether or not you’re going to try out being exclusive to Amazon by signing up with KDP Select (exclusive) instead of KDP (sell where else you choose). Some self-publishers choose KDP Select or being exclusive to Amazon for their first 90 days. This lets them test the market by having their books eligible for programs like Kindle Unlimited (a bookclub that lets Amazon users read unlimited ebooks), or to give their books away in an advertising campaign for 5 out of their 90 exclusive days (books are committed in 90 day blocks). You may consider KDP Select if there’s a lot of competition in your genre, as you may find readers more willing to try out a new author without having to pay for the book. All of this, of course, brings us to the big question, which is how many books are actually selling? While it’s great to find the perfect niche where your ebook fits and see that you don’t have a lot of competition, if there aren’t any buyers you’re still not going to make much money. That’s where the K-Lytics reports come in. They tell you the secrets of how to find high sales in niches of low competition. What are some of those spots? You may not be surprised to find that 3 of the 4 hot niches, where there are 2000 to 10000 titles and high sales, all fall under the Paranormal sub-genre: Angels, Psychics, and Witches & Wizards. You’ll also find great potential for Clean & Wholesome romances, along with Gothic, in the smaller niches that have fewer than 2000 titles. Overall though, contemporary romances lead in Kindle sales numbers, followed by new age & college, along with romantic comedy and mystery & suspense. There’s one more thing you’ll need to consider, though, before you can turn your dream to make money selling your romance ebooks and become an Amazon Millionaire a reality. What’s that? It’s an economic truism that the more competition there is, the lower the price drops in order to entice buyers. In fact, according to statistics from K-Lytics, romance may be the top selling genre, but it also has the lowest price levels of all thirty genres in their free monthly reports. In fact, the average price of the top selling romance novels is around $2.97, compared to a high of $12.48 in education and teaching. In between, it’s interesting to note that even genres like biographies and memoirs have an average of $6.88 over the top 100 titles. Remember, markets change constantly, so it’s important to stay on top of them, whether you do your research yourself or rely on market guides you can purchase. Excited about getting your romance — or other genre — novel onto ebook shelves? Join me in class to go through the process step-by-step. PreviousWorried About Making Writing Boring if it’s Easy? NextEffective Words: Do Your Words Have the Strength of a Brick Wall or a Tissue?